Unfortunately, change as a concept has become a “catch all” in the business world. It collaborates with clients to confirm what actually needs to change and how that change will be evaluated. 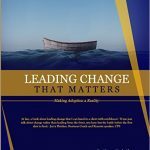 It uses its robust and field-tested framework to empower you to shape change that matters because stakeholders remain at the heart of your change initiatives. The change we are talking about is the change that lets you manage the unexpected and innovate in ways that allow you to successfully ride the waves of those uncontrollable events by first building resilience through a planned change. Failure to navigate change that matters can leave you adrift with no land in sight and going down for the last time. Have you been through an organizational change? We want to know your experience... good or bad because it will help us find a way to make our publications more "bullet proof." We know that stakeholder involvement is the key to successful change but we need your advice about how to ease the way for everyone involved.